This week was a short week with only 3 runs. After last week's 5 runs, this should have felt like a breeze, but I managed to be fairly tired by the end of my 3rd run anyway! 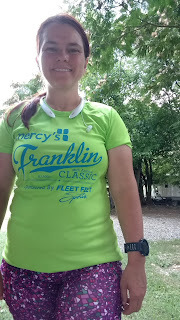 My steady pace run day. 3 miles again. Soon that will bump up in mileage. I again went to River Park. Maybe I should vary it up a bit, but for now I like having the same route to compare to. It was warm and humid, but overcast and breezy. I thought I might get rained on, but I never did. I was able to control my pace and my heart rate during this run! Yay! I ran the entire 3 miles and did 12:33, 12:24 and 12:33 splits. I would have preferred the second mile a little slower, but very happy with my run. I managed to keep my heart rate well under control. 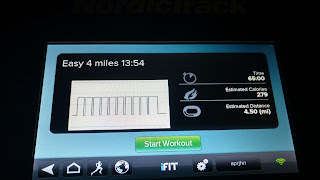 When I glanced at my HR around 2.5 miles I was surprised to see it hanging in the high 150s. I have been struggling to keep it under 170 during these runs and here I wasn't even hitting 160 while still hitting my pace goal. Awesome! Wednesday afternoon, my work had an outing at the Nashville Sounds game against the Colorado Springs Sky Sox. (Sounds won 2-0, yay!). 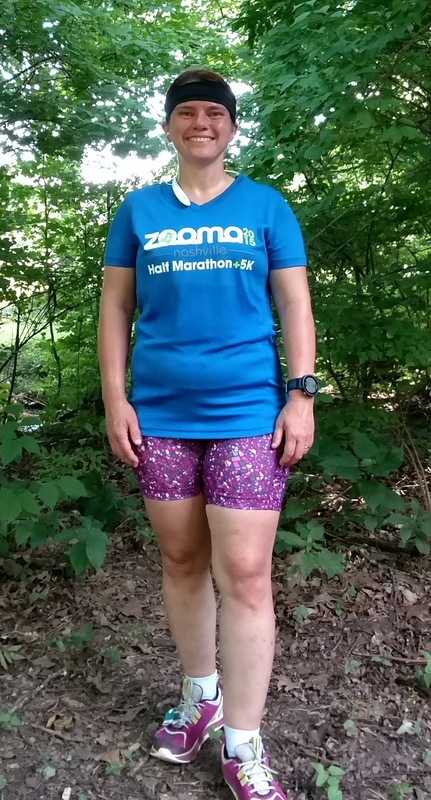 After the game, I headed to Percy Warner Park to run trails. I was planning 6 miles, but that stretched into 6.45 miles. My long run is supposed to be run at 13:29, but there's no way I can run that on a trail, and definitely not this trail. I started at the Nature Center and took the connector trail to Mossy Ridge (the red trail) and did the loop before heading back to my truck along the connector trail. One of the tough downhills. This picture just doesn't show how steep this is! I have spent many hours on the horse trails at Percy Warner Park, but only occasionally make the opportunity to run the pedestrian trails. It was fun to think of all the times I've been on the other trail when they connected or went parallel to each other. This trail was tough for me and I was only able to turn in a pace of 17:03. It was hot and very humid. I ate 25% of a picky bar before I started out, 50% of what was left at 3 miles and the rest at 4.5 miles. I didn't have any of my running water bottles with me, so I carried a 16 oz plastic bottle. I rationed out the water evenly over my run, but would have liked to have had more. When I got back to the Nature Center, I filled up and drank during my cool-down and poured some of the water over my head. What a run. 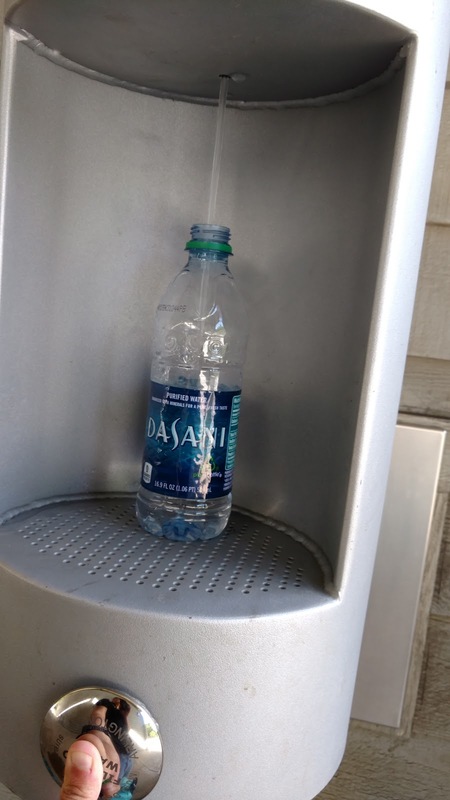 Awesome water bottle filler at the Nature Center! Misty view from the hill. Since I did Percy Warner Park on Wednesday (which had a good bit of elevation to it), I honestly thought about turning Hill Friday into an easy day on the treadmill, but I decided that a 3 day run week was not the time to wimp out. Besides, my hill workout on pavement is probably very beneficial to me since the Iron Horse Half Marathon will be a street race with some hills on it. 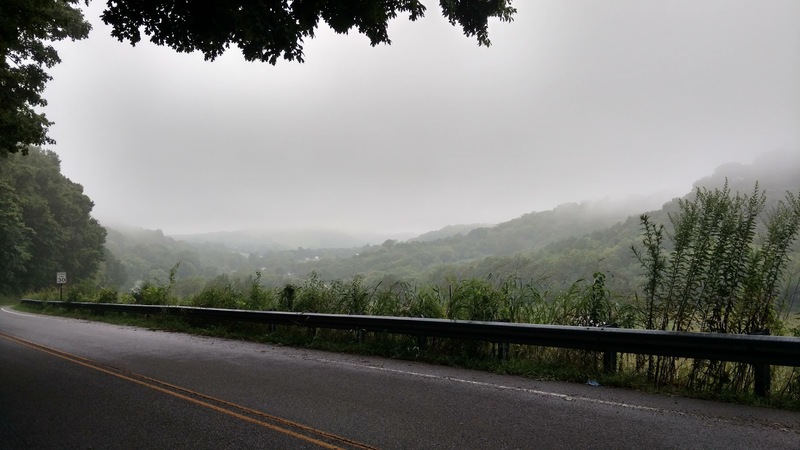 So I headed to my nearby hill and repeated my hill workout. This time, I pushed myself and jogged 10 seconds, walked 50 seconds up the hills. All the hills. And jogged the downhills. Again, a hot and humid day, so lots of sweat involved. But a good solid effort and interestingly enough, the time went pretty fast when I was watching for the time to jog up the hills. 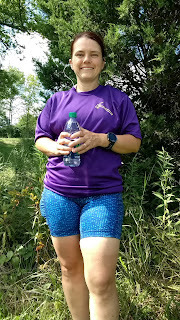 This day I wore a brand new pair of Altra Intuition 3s that I got on sale since they're last year's model. My favorite street shoe is the original Altra Torin. I have several pairs of those, but they're wearing out and I can't get them anymore. Boo! So I decided to try the Intuition 3s. They're not as cushioned as my Torins and they don't seem as deep. My right heel especially kept slipping out of my shoe on the uphill jogs. I'm going to have to play with my lacing to see if I can fix that, but these may be shunted off to be treadmill shoes. I have started using SportTracks.mobi combined with the SportTracks 3.1 desktop application. 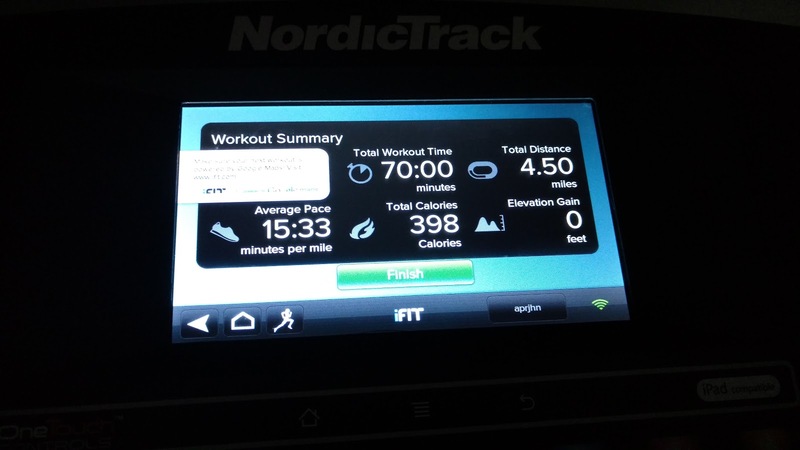 I have the website automatically grabbing my workouts from Garmin Connect and the desktop app grabs the workouts from the SportTracks website, so it's fairly effortless to get going. It's a paid site. $60/year with a price freeze guarantee and a fully free 45-day trial. I'm still in my trial period. But you can try it out without providing any payment information or credit card info. I've owned SportTracks 3.1 for many years. Anyhow, now I can provide weekly totals minus my warm-up and cool down, so I'll start adding those numbers. 4 runs scheduled for this week, but 2 of them are easy runs and no long run this week, so looking forward to a great week! Week 3! My longest week so far in this training cycle and the first time I've ever tried to run 5 days in a row. Like ever. 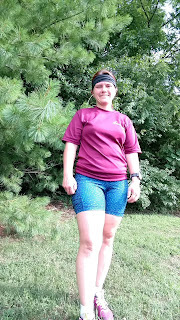 My lululemon speed track shorts and one of my 1/2 marathon shirts. 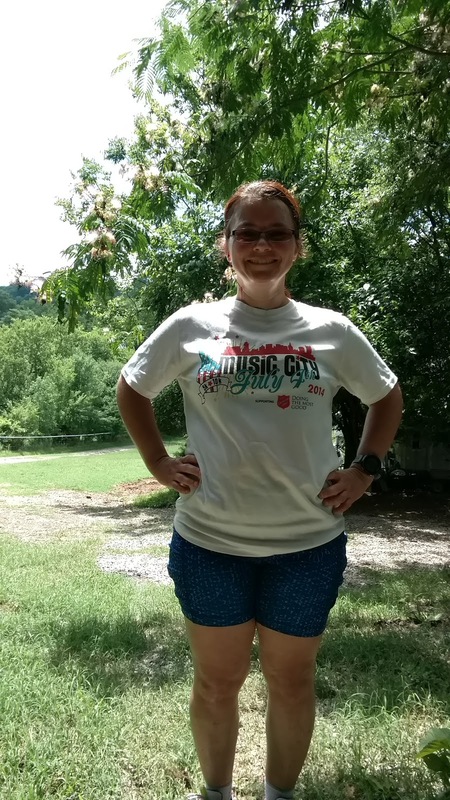 Since I ran last week at River Park, I decided to do the same workout this week and see how it went. Last week I had trouble controlling my pace, but this week was much better. It was quite hot and humid. 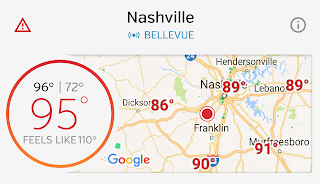 95 degrees with 71% humidity. My plan was a 3 mile run at a 12:36 pace. 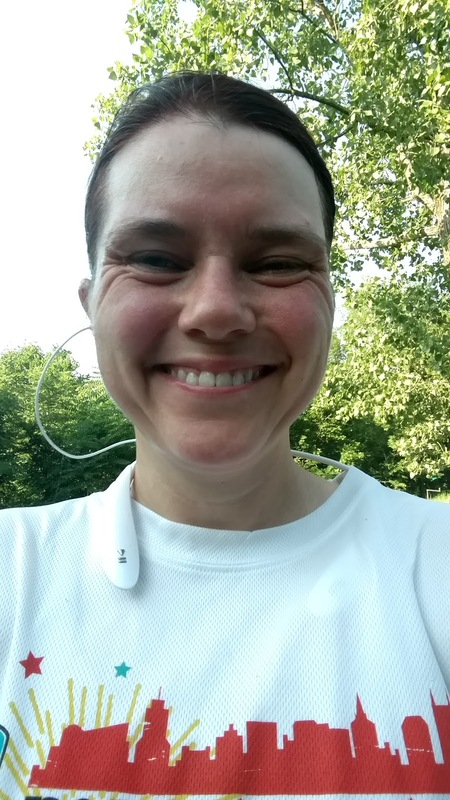 I ran the entire 3 miles without walking once and was able to control my pace fairly well. Splits were 12:26, 12:30 and 12:36. So got a little slower each lap. Would prefer to see that inverted, but hey, I'm just happy I was in the ball park and didn't have to walk any. My average HR for each split was 157, 167, 170. That doesn't bode well for eeking out a 4th mile. I can't be getting over 170 on these runs as that puts me into my zone 5, which is reserved for intervals only. But still, this was a successful run. I was tired and a bit cranky after working all day and then running, but felt better after some food found its way inside. After my solid effort on Monday, my Tuesday run was my slowest paced run of the week and my slowest pace of my training cycle. I'll do several of these through the training cycle. Goal pace was 14:51. Jog for 2 minutes 45 seconds, walk for 1 minute 30 seconds, repeat. 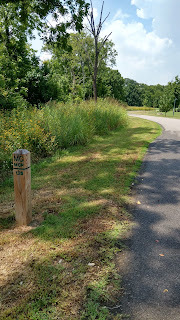 I headed to Mill Creek Park in Nolensville. It's small, but good for a 3 mile run. Much more than that and I'll have to do more repeat than I prefer. 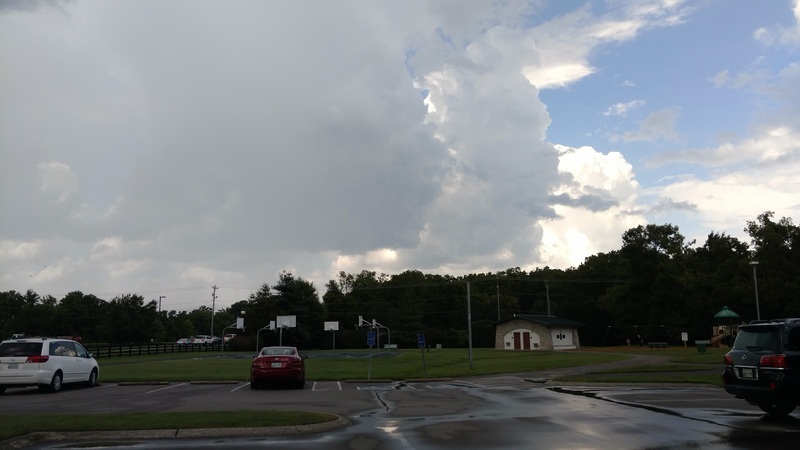 The weather was very breezy and threatened rain, but I only got sprinkled on. I was covered more in sweat than rain. Then I headed to the nearest Publix to take advantage of their Ben & Jerry's Buy One, Get One sale. I run for ice cream! Covered in sweat, but happy after my run! Wednesdays are my long run days for this cycle. Thing is, I'll only be running on Wednesdays 2 out of 3 weeks. That's a little different, too. For my previous training cycles, I had a long run every week. Long runs are supposed to be at a 13:29 pace. This week, I decided to throw pace out the window and headed for the trails. 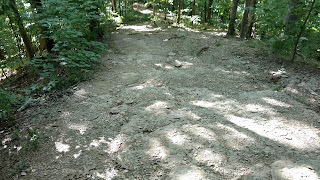 I love trail running, but a lot of my training is on paved trails. I get a lot out of trail running, though. Very good for my soul, as well as my balance and overall fitness. I got up early and drove to Henry Horton State Park to run before work. I ran along the river. I had a very hard time controlling my heart rate and breathing. Trails are always harder for me since I can't just mindlessly put one foot in front of the other. But that also makes them so much more interesting. While this was a tough run for me, I was happy to be out doing it and very happy to complete it without twisting an ankle! I was scheduled for a 3 mile easy run, but I didn't get to do it until after work. 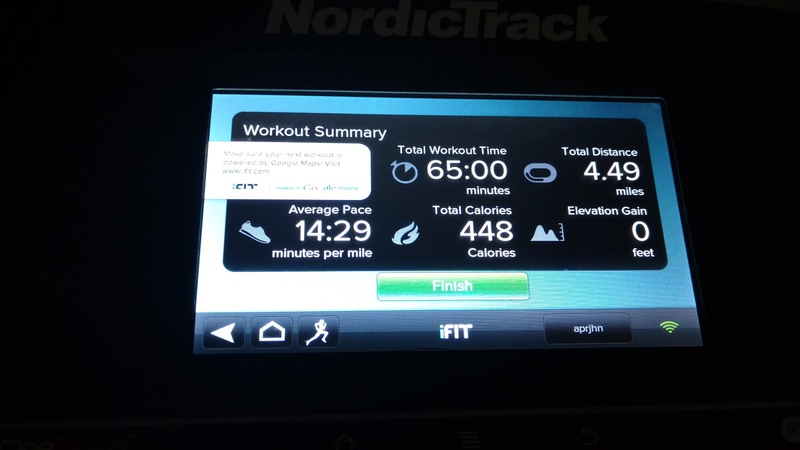 I decided I didn't want to run outside again, so I just pulled out the treadmill iFit workout from last week, even though it was 4 miles instead of 3. No issues with this run, although during the 4th mile I did fleetingly wish I'd stopped at 3! My 5th run this week! And my last one. The last 2 weeks, I've done the same hill workout, so why mess with a good thing? I think it's interesting to compare my performance from week to week. This time I got to do it first thing in the morning. 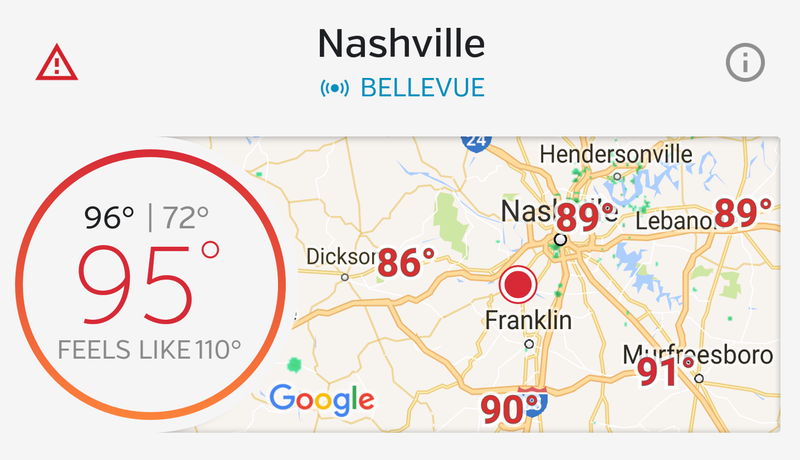 High humidity, but slightly lower temps. I jogged 10 seconds, walked 50 seconds up the first hill and then ran the downhills and walked the uphills. I took a little longer than last week, but felt better this week, which was surprising considering this was at the end of running every day of the week. I have now completed the first 3 weeks of my training plan. I've hit every workout and been pretty close to my pace goals with the exception of my trail run this week, which is ok, since it was trail. I feel surprisingly good after running so much more than I normally would in the early weeks of a training program. I've definitely run more days. My future weeks will follow this same pattern. The distances will get longer, but the paces will stay the same. This training cycle is not about speeding up. It's about consistency and control and so far I'm liking it. I'm ready to start my next 3 weeks where I start back at 3 days of running and build back up. So this week will feel like a breeze! At least I hope so! It's a step-back week in miles and days to let my mind and body reset. Training for my Iron Horse Half Marathon continued with a 4 day schedule. I double checked my training logs and the last time I ran 4 days in a single week was October 2014 in training for my first half. 3 days of 2 mile easy runs followed by a 14 mile trail run on day 4. So this is definitely a new thing for me. I started my week with a great run at River Park. My planned run was a steady pace run at a 12:36 pace. It was warm, but overcast and not overly hot. A surprise for an afternoon run. I had trouble keeping a steady pace and my pace wobbled all over. Mostly too fast. I couldn't control my pace enough and had to walk about a minute each mile to get my average pace back down. 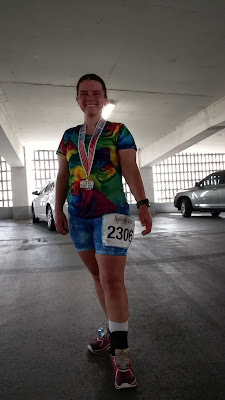 I ended up with an overall average pace of 12:33. I'm trying to work more in my lower heart rate zones and stay out of my highest zone (5). I did well at that, but my average heart rate did go up with each mile I ran. 156, 162, 166. These are within my zone 4, but looks like another mile would have put me squarely zone 5. By the end of my run on Monday, I knew I was sick. My throat was sore and my head throbbed. Sure enough, by mid-morning Tuesday, I was in a full blown head cold. But I had a run scheduled and I didn't want to be derailed this early in my training if I could get away with it. 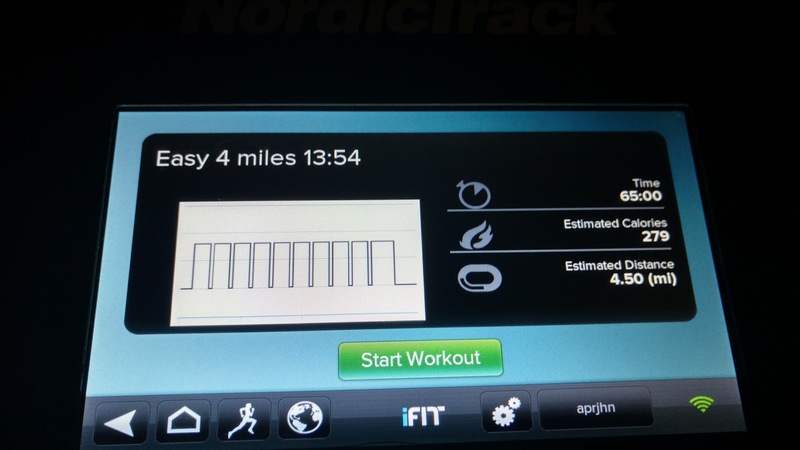 So I headed to my handy treadmill for an easy 4 miles. One distinct advantage to the treadmill is I can control my pace there. I set up an iFit workout to have me jog for 2 minutes 45 seconds at a 13:03 pace and walk for a minute and a half. Repeat that to get 4 miles and then a walking cool down. All I had to do was select the workout, press play on the Hulu app on my tablet and get the miles done. On the horse front, I had great news from my vet that cleared one of my horses for light riding and the other would be ready for light riding in a couple weeks! Yay! Still sick on Thursday, I decided the treadmill worked so well on Tuesday, I'd give that a go. 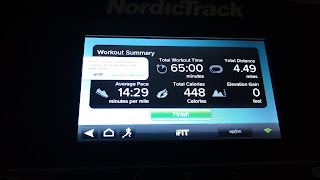 So I set up another iFit workout for 4.5 minutes jogging at a 13:03 pace and walk for 1 minute to get my 4 miles in. My target pace was 13:54, so somewhere my math was off to come in at 13:42. Oh, well, it worked out ok. I look way better in this pic than I actually felt. Due to being sick and already having run 3 days and getting to ride my horses more this week, I went into hill work with less than a joyful attitude. But it was my last workout of the week and I headed out in the heat of the day to get it done. Still being sick and a little tired, I just chose to do the same hill workout I did last week. 3.3 miles and 630 foot elevation gain. This time I did a few jogs up the first hill. 10 seconds jog, 1 minute walk. 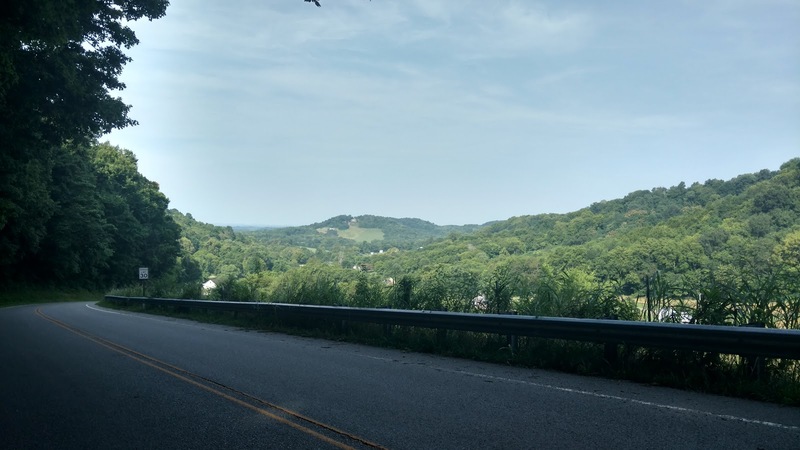 I didn't feel like doing that for the rest of the hills, so didn't, but when I feel stronger or want more of a challenge, I think that will be a great way to slowly build back to running up hill again. I'm pretty pleased that I was able to finish 4 days of running this week, even while sick. Course, they were mostly easy miles, so that helps. Next week comes another challenge. 5 days of running!